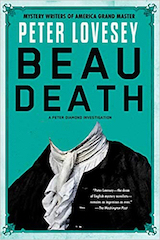 Beau Death opens with a wrecking ball crashing into the roof of a small terraced house in Bath. When the dust has cleared, a skeleton in eighteenth century clothes is revealed. Can this possibly be Richard ‘Beau’ Nash, the man who by force of personality turned a Somerset backwater into the most fashionable city in Britain? Clues emerge that suggest as much and, more worryingly, that a murder was committed. Peter Diamond and his team are reluctantly put to work on what seems an impossible historical quest. Then a modern murder is committed in front of a vast audience at the World Fireworks Competition right next to the Royal Crescent. This apparently unconnected killing galvanizes the team but has the unexpected effect of bringing Beau Nash and his death to centre stage. Through a series of bizarre occurrences, the Beau refuses to be side-lined. Diamond is by turns mystified, angry and close to paranoia. Under such pressure can he solve both cases? Regular readers may guess the answer, but of course Diamond never relies on guesswork.